When I'm looking through cookbooks or magazines, browsing at recipes online, the same kind of things appeal to me on repeat. So not surprisingly, I'm drawn to recipes featuring things like chocolate and peanut butter when it comes to baking. And cookies...well, they're a staple in the home, aren't they? I caught a recipe for peanut butter-dark chocolate thumbprints in a magazine and it was the only excuse I needed to whip up a batch. I love thumbprints - it's really not all that much work to make a little chocolate ganache filling to place in the center of these cookies but that extra touch makes them a little extra special. It's like a treat within a treat. If you're like me, you see it, you smile, and you just want to grab one and eat it. So this is very simple; we have a peanut butter cookie, with a round of chocolate ganache filling in the center. The peanut butter cookies are soft and chewy, full of peanut butter flavor. Using chunky peanut butter gives them a little bit of texture. After baking and cooling, the center is filled with a simple dark chocolate ganache that's a great bonus treat. The ganache sets up and you can store these cookies with a piece of parchment or wax paper between the layers. Best part, they store well - at room temperature - for several days. The cookies stay soft, moist, chewy, and basically...wonderful. The combination of chocolate and peanut butter may not be a must-have for everyone but I know there are a lot of us out there that do crave those two things. And I'm guessing the craving comes on pretty often (I know it does for me); this will totally hit the spot! I spotted this recipe from a magazine called Bake From Scratch. The dough is very simply mixed together and then rolled into balls. Though the recipe doesn't call for it, I highly recommend chilling the dough before rolling. In fact, chilling it again for a bit to firm it up after you roll it and before you bake is a good idea because I found that the cookies spread a bit more than I would've preferred. I'm used to making thumbprints where you make the indentations before baking but in this case, you remove the cookies from the oven about midway and make your indentations then. Then it goes back in the oven. When the cookies are just set and finally done, you may need to go back and reinforce the indentations a bit more. I would've preferred a slightly thicker cookie but I won't quibble too much. I whipped up a basic dark chocolate ganache, using an equal ratio of chocolate to heavy cream, with a spoonful of corn syrup for shine. Conveniently, the recipe actually uses butter instead of cream. I say "convenient" because I don't normally have heavy cream on hand and wouldn't want to buy it when I only need a small amount. I tend to forget that ganache can be made with other things like butter or water! In this particular case, however, I actually did have some cream left in my fridge so I made use of it. I'm glad I made a full batch of these cookies and had about 2 dozen of them (okay, I think I ended up with 23 to be exact). They were gobbled up by my family and I, and snacked on during a playdate. The cookies were gone in two days but I'm pretty confident they'd hold up for as long as a week. 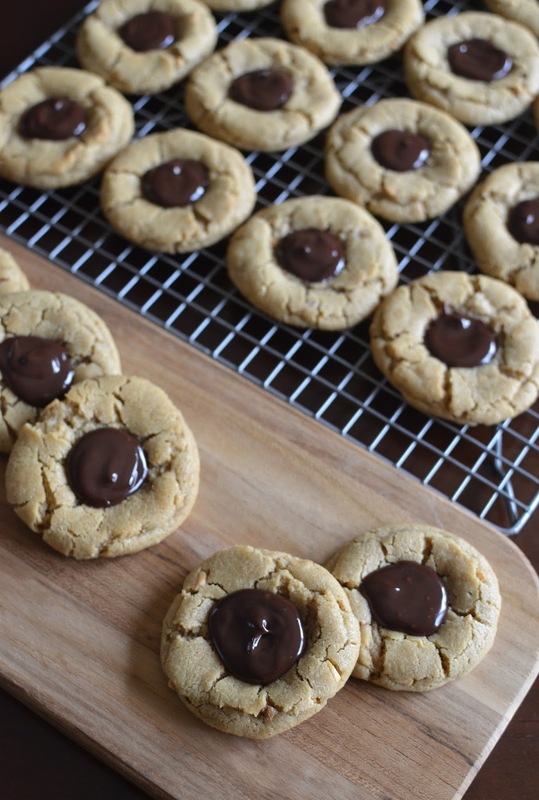 The peanut butter keeps the cookies soft and they stay moist and chewy for you to enjoy at your leisure. * Alternatively, you can use 2 tablespoons butter instead of the cream. Melt and stir together until smooth. Make cookies: In a small bowl, whisk the flour, baking soda, baking powder, and salt together. In the bowl of a stand mixer (or using a hand mixer), beat butter and sugars together until light and fluffy, about 3 minutes. Stir in the peanut butter, egg, and vanilla. Gradually stir in the flour mixture until combined. Cover the cookie dough with plastic wrap and chill for at least an hour or overnight. When ready to bake, preheat oven to 350 degrees. Line 2 baking sheets with silicon baking mats or parchment paper. Roll dough into about 1-inch balls and place onto the baking sheets, about 2 inches apart. (If time permits, chill the cookie dough balls on the baking sheets for 15-30 minutes; this is to help cookies spread a little less during baking). Bake for 10 minutes, then remove cookie sheets from the oven. Use the back of a small spoon to make an indentation in each cookie. Return cookie sheets to the oven and bake for another 6-7 minutes, or until set. It may be necessary to use the spoon and make indentations again after this second round of baking. Make filling: Heat cream and corn syrup until just to the boil (you can do this in a measuring cup using the microwave but in short increments and stirring frequently). Pour the hot cream over the chocolate and let sit for a minute. Stir gently with a whisk until combined. If the chocolate is not completely melted, you can heat the mixture in the microwave at half-power, for 5-10 seconds at a time, stirring well after each. Let mixture cool and thicken slightly. Transfer ganache to a small plastic sandwich bag, cutting off a small opening to make a tip, and pipe a round of filing into each cooled cookie (you can also use a spoon instead). Set aside and allow filling to cool and harden. Cookies can be stored in an airtight container, at room temperature, for up to a week. Peanut butter and chocolate...definitely a crowd pleaser! These cookies look terrific! Oh gosh I am definitely always drawn to anything peanut butter and chocolate!! Thumbprints are a huge favorite of mine ... I've never used ganache though for filling - that's such a good idea! Hope you had a great Easter weekend Monica!! I think I love anything that involves ganache, Ashley. : ) Hope you had a great weekend, too. Hi Monica, peanut butter and chocolate is one of my favorite flavor combos. These cookies look delicious! Two of my favorite food groups - chocolate and peanut butter. Thanks for sharing this lovely recipe Monica. What a terrific bite it must be! Totally too easy to love...I figure you can never go wrong and I don't need much of an excuse to get this combo going. Hope you had a nice Easter weekend, Tricia. I love the idea of the dark chocolate and peanut butter thumbprints, the only kind I have ever had or seen has been the ones with the fruit jam. I confess to not being a peanut butter and jelly fan so this is much more my speed as well. Peanut butter and chocolate! Yummy! I would love them! Glad to hear it, thanks. Oh my gosh....that filling!!! Love that you used dark chocolate! Thanks, Juliana. It's always fun to make a batch of cookies. Enjoy your week, too! I agree; they are kind of cute! Thank you! I have made such cookies a couple of years ago and I loved them! Yours look absolutely mouthwatering! Sounds great; chocolate and peanut butter is a great combination, for sure. Thank you, Kelly; you are always so sweet and supportive.